The SUBDUER is He Who subdues and vanquishes overwhelmingly everything and anything. Allah, Glory be to Him, says, “He is the Irresistible, watching from above His worshippers.” (AN‘AM, 18). The SUBDUER’s means to subdue and conquer His enemies are amazingly infinite. 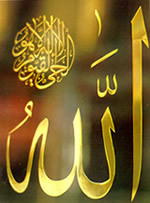 All existing things in heavens and on earth are in His Gripand this can not be attained save by Allah, the SUBDUER. All existing things are helpless, and on the Day of Resurrection the Almighty calls from above “Whose will be the Dominion that Day? That of God, the One,the Irresistible.”(GHAFIR, 16). Praise andGlory be to Him, He is Allah.